Welcome to all the visitors to my blog. I hope that you are enjoying the variety of posts from cardmaking and scrapbooking to photography. 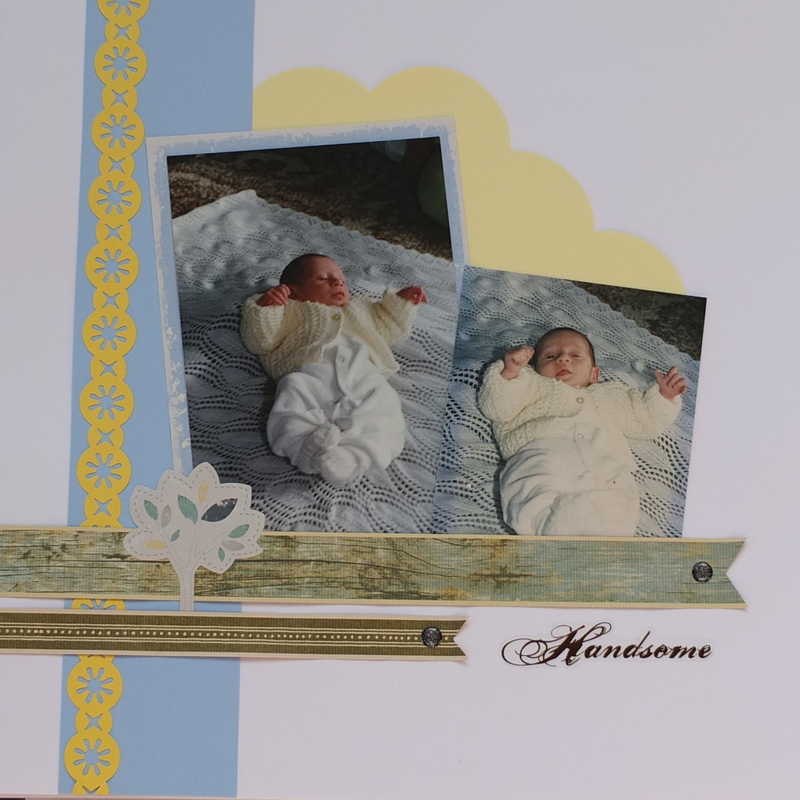 I am still working on my son’s scrapbook album and here is a photo layout of him at 2 weeks old. He was such a tiny wee baby and very photogenic and it is hard to believe that he is now 23 years old and taller than me! Sorry the photo seems a little uneven but I hope that you can see my layout ok. I love using the border maker twinkle chain cartridge and I think that will be a theme throughout this album. I also like to keep my layouts fairly simple and as I have said before I try to coordinate colours to bring out the photos as they are the focal point of a layout. The blue and yellow background highlight the lovely yellow jacket that James is wearing. Another factor in how I scrapbook is the photos are old and printed way before digital cameras were developed (I really am showing my age here!) and some of my photos are not great quality and I just have to make do. It makes a huge difference with all the digital camera and post production technology available today and the quality of photography is so much better. I have tried to print of scanned negatives but the quality is not as good. But you can’t change the past and I have to do what I can with what I have. Thank you for your offer Amanda. I just might take it up as there are a couple of photos that are not great. You have a good day.